Today is the day that support for Windows 2000 ends, this means that basically no more patches if your still using it, also Microsoft probably don’t give a hoot about you as you haven’t bothered to replace your OS in 10 year. Of course there aren’t many people still using Windows 2000 so this probably wont mean much at all. If you want to know more see the Microsoft Support Life-cycle Policy FAQ. This entry was posted in Software / Applications and tagged Microsoft, Software, Windows 2000 on July 13, 2010 by JAB_au. The change log is available from the OpenTTD website. This entry was posted in Games and tagged Games, Software, Transport Tycoon, Video Games on May 1, 2010 by JAB_au. OpenTTD is modelled after the original Transport Tycoon Deluxe game by Chris Sawyer and enhances the game experience dramatically. In March 2004 OpenTTD 0.1 was released. Hardly a month later in April 2004 OpenTTD 0.2. And today, six years later… OpenTTD 1.0.0. It was a lot of work, hundreds of thousands of translations, tens of thousands of commits, thousands of graphics, hundreds of patches, dozen of sounds and musics, and one goal. How many people contributed? Dozen of artists, translators and developers, hundreds of testers and bug reporters, and also the thousands of players. Looking at the readmes and credit sections only gives a small hint. Some of those who were main contributors left long ago, and there are only a few who know them all and talked to them once via IRC or the forums. But if you consider all contributors, including those of the used libraries, and the external artists of OpenSFX… Well, then most likely not every contributor actually knows OpenTTD. So in the end, what was most fun in the past 6 years of OpenTTD? Playing? Contributing? Modding? Talking? Or just taking part in a large crowed moving in one direction? One direction? Well, at least in bigger scope. But in more detail there were quite some parties involved in the process. Sometimes pulling in the same direction, sometimes maybe pulling in slightly different ones. 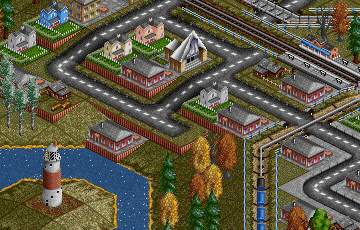 Let’s just mention some of the projects around OpenTTD which influenced it in this or that direction: The various integrated builds and patchpacks, first of all the MiniIN. Then the first Town Growth Challenge, TTDPatch, #openttdcoop, Goal Servers and the big patches (Subsidiaries, YAPF, YAPP, CargoDist, 32bpp & ExtraZoom). And not everything which made it into main trunk was happy sunshine, just to mention the first approach to Path Based Signalling, or the attempts around the AI. But when looking back, most turned out fun. Thank you! This entry was posted in Games and tagged Games, Software, Transport Tycoon, Video Games on April 1, 2010 by JAB_au. OpenTTD 0.7.5 Released, this fixes the NewGRF cargo payment was that broken in 0.7.4 and a major bug that can crash servers remotely (CVE-2009-4007). Secondly OpenTTD 1.0.0-beta1 is also available, with this version you can run OpenTTD without the original Transport Tycoon Deluxe data files. This entry was posted in Games and tagged Games, Software, Transport Tycoon, Video Games on December 24, 2009 by JAB_au.